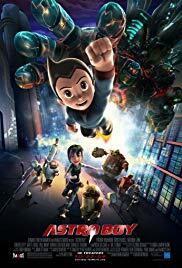 Astro Boy is a 2009 Hong Kong–American computer-animated superhero film loosely based on the manga series of the same name by the Japanese writer and illustrator Osamu Tezuka. It was produced by Imagi Animation Studios, and directed by David Bowers, who co-wrote the screenplay with Timothy Harris. Freddie Highmore provides the voice of Astro Boy in the film alongside the voices of Nicolas Cage, Bill Nighy, Eugene Levy, Nathan Lane, Kristen Bell, Matt Lucas, Charlize Theron, and Donald Sutherland.